We spend half of our time using smartphones, juggling among various applications on it. Sometimes we find our home screen messy filled with various applications and it becomes difficult to manage. POCO Launcher is an application that will help you to manage and customize your home screen the way you want to making it easier for you to reach different application of your phone in a few seconds. This application is brought to you by Xiaomi Inc. This app gives its users a clean Home Screen. This feature will make the home screen of your smartphones well organized and easy to use. Users will get all the application in the app drawer. POCO keeps all the applications in App Drawer so that the Home Screen will be neat and clean. The app has made it convenient for users to search for the applications. Convenient searching with app recommendations, icon color categories, and lots of other customizable features allow you to find what you need much faster. This application clubs the same kind of applications into one group so that it becomes easy to manage the applications. Applications will be categorized into different categories and users can create custom groups to always keep important things just a tap away. POCO Launcher provides the privilege to use third party icons. Now you can easily customize your home screen with third party icons. This feature will give your home screen a better and unique look. Now you can keep your applications hidden for privacy. Yes, that’s true, POCO Launcher will help you to keep your privacy secure. You can hide the application. It hides the icon of the application. 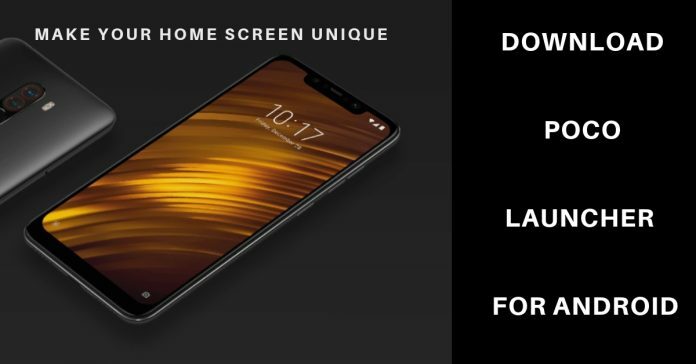 POCO Launcher is a great application to manage your Home Screen and is born at breakneck speeds. Forget about slow system animations!